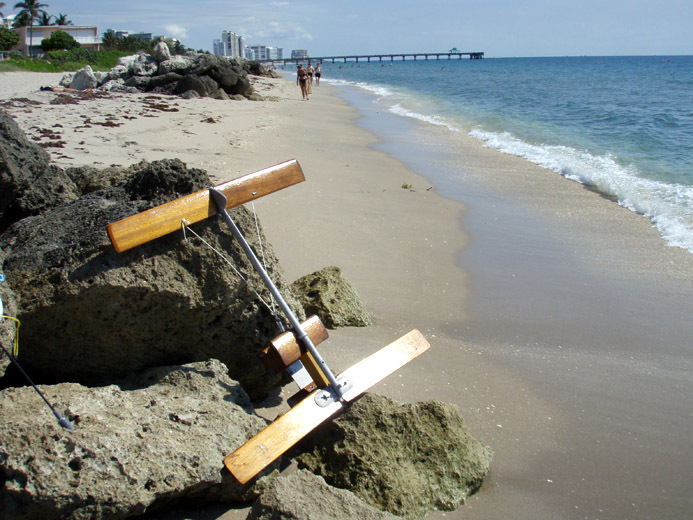 I'm currently designing a boat for kite/human power, hopefully to use in the WaterTribe Everglades challenge, and am thinking of using an oscillating foil in lieu of paddling for the human powered part. I'm actually thinking it may be possible to have a foil mechanism that doubles as a means of propulsion when the wind is calm and a flying foil when under sail. Think I could take a look next time I'm down your way? The front foils pivot on an axle driven by the moment arm of the kneel attached to your calves. The rear fixed foils act as a stabilizer. The lines and central spring on the kneel provide slight tension to aid in the return on the foils during oscillation. Cal said once you start oscillating the foils you don't really need the return tension anymore. Guys have been using oscillating foils for propulsion concepts for sometime. I even recall one at the first manned UW sub races in Palm Beach. If you're going to be in town, send me a PM. Another look at DARPA's efforts to utilize the Aqueon concept using newer materials. Program Manager: LtCol John Lowell, Ph.D. The PowerSwim program is developing highly efficient, human-powered swimming devices for use by combat and reconnaissance swimmers. This program explores a new concept in swimming propulsion that uses the same oscillating foil approach to swimming that is exhibited by many fish and aquatic birds. This propulsion approach is more than 80-percent efficient in conversion of human motions to forward propulsion. Typical recreational swim fins are no more than 15-percent efficient in their conversion of human exertion to propulsive power. This dramatic improvement in swimming efficiency will enable subsurface swimmers to move up to two times faster than is currently possible, thus improving swimmer performance, safety, and range. 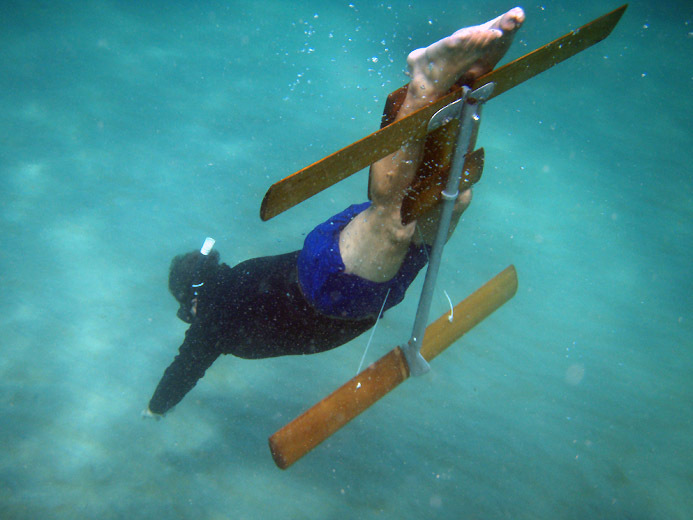 The actual inventor of this concept and over 50 years ago, Cal Gongwer hosted about four pool parties in which DARPA staff examined, used and questioned Cal at length about the Aqueon. DARPA then proceeded to consume almost $3M of tax payer dollars in the mandated creation of "new" technology. No credit or compensation has been given to Cal by DARPA in any of this. Doesn't inspire much pride or confidence in this government agency. I wonder how Tom managed to do the DYN turns - in a pool with shallow ends it may be quite challanging with the Aqueon. This is swimming horizontally in a 25 m pool for distance. Just got some new details about Tom's performances with the Aqueon: the DYN swim was in a 25m pool with the ends 120 cm deep! It must have been pretty challenging since the rear rigid blade is exactly 120 cm wide too! Additionally, the fin is quite heavy, it means all those turns certainly cost Tom quite a bit of energy. I'd been toying with the idea of competing with the Aqueon since I got it. I spent a fair bit of time training with it three years ago but haven't used it much since then. The CAFA competition seemed like a golden opportunity to put some numbers up despite a lack of recent training with it. To be perfectly honest, the Aqueon in its current form is no revolution in underwater propulsion. The improvement in efficiency is more than eaten up in increased drag, incredible mass (>20lbs) and difficult maneuverability. Still, it is a fun device to fly and I'm glad I dusted it off for the comp. The constant ballast dive was the most daunting, both for me and for the organizer. The wide wings of the Aqueon don't mix well with the lanyard and the descent line. One has to be keenly aware at all times where all of these things are, especially at the start and turn. A back flip with head to the wall is the only way to start as it finishes with the diver facing the line with minimal risk of entanglement. The sink phase was very slow so I had to pump the blade occasionally to keep some forward momentum. At the turn I had to swing my body well clear of the plate to avoid knocking the bottom camera. On the start of the ascent I typically feel like I don't have much power against the negative buoyancy but at 20m and shallower I feel like I can outrun anything with the Aqueon. Dynamic apnea presents its own challenges, especially in a 25m pool. Obviously the turns are inherently difficult. The only way to turn is to keep level and straight. Any tilt would drive the wing tips into the bottom and any bending of the knees would hammer the front blade into the bottom. It is therefore necessary to scull with the hands to finish the turn. The aqueon is not very efficient at low speed so it is necessary to push a bit harder than otherwise ideal. The Aqueon takes a life of its own at medium fast speed. The blade suddenly grabs the water and you propel yourself more by leaning against the blade than by moving it. You have to forget everything you know about the monofin; pump entirely from the legs and relax the upper body. Thanks for undertaking this experiment and reporting back on your approach and impressions. Congratulations on your world record Aqueon performances. You are the first to do so to my knowledge. What aspects of the Aqueon design would you work in modifying for DYN and CWT if any? 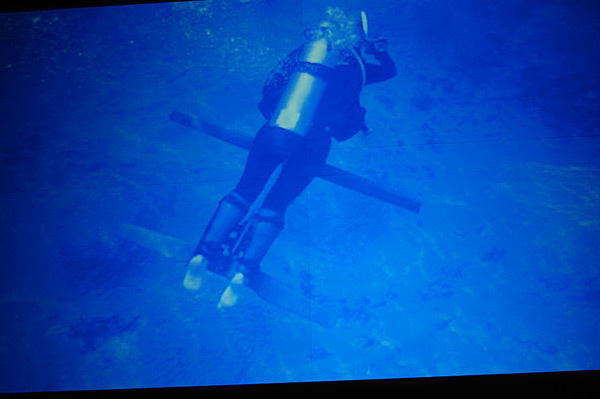 Things like going to composite materials to reduce weight (momentum too though), changing the foils to a swept back tapered configuration (more whale caudal fin-like) with a deflectable trailing edge vs. the current orthogonal wooden foil setup relative to the kneel of the Aqueon, positive securing of the foils to avoid accidental loss during performances. What other ideas come to mind? Cal told me that others had tried some of these mods with limited change in performance characteristics. Then again I doubt they were concerned about competitive considerations. Last edited by RickI; 09-30-2011 at 09:40 AM. Good points, particularly about sliding the foils out on the axel by accident. Worse what if one falls off at depth?! Something more positive with less friction would be a strong advantage. Your suggestion of a mobile ankle mount is intriguing if I follow your meaning. That would allow more deflection of the front foils with less effort, hence easier, tighter and faster turning of the Aqueon. Also, you probably noticed the boards can become uncomfortable, it would be nice to avoid that with your ankle mounts. As DARPA ran off with Cal's idea, some study of their more contemporary design would be helpful in considering changes. Sweeping back the front foils would impact your displacement in strokes but it would also reduce drag. I think the ability to feather the trailing edge of the foils would provide some strong advantages as well providing less turbulence through strokes. The rear stabilizer serves to provide resistance to excessive pitch oscillations through the sinusoiding of the front foils. You simply need something of adequate reactive force to stop you from seesawing in place through the motion of the front or propulsion foils. Going with symmetrical foils made sense from a production and performance standpoint using wood construction decades back when Cal developed this. With synthetics you could variation size, aspect ratio, etc.. Perhaps you could come up with something which would provide the necessary pitch stabilization without the excessive width. Perhaps something longer again with trailing edges that could also be feathered. I don't think fins would provide sufficient surface area to do this at least not with the current front foils. In the case of a monofin, I am less certain. When I mentioned narrowing and increasing the length of the stabilizer I was thinking of something roughly in the shape of an odd monofin. It would need to likely have more blade resistance than a monofin you would like to use on its own though, I think? It seems if your stabilizer was too long it would create excessive drag from projected area. This is one good reason to try to stick with narrower, longer foils as are currently in use. Good stuff to work on! Other ideas out there? Last edited by RickI; 09-30-2011 at 01:34 PM. I just came across a local article about Cal Gongwer in the Sunsentinel, http://articles.sun-sentinel.com/198...ns-engineering . I didn't recall it but he competed in the first International Submarine Races held on Singer Island in 1989. I shot the race for a local rag at the time. I think I have a photo of his entry, have to go through the archives. "Near 74, Calvin Gongwer Is Competition`s Old Man Of The Sea. Call him the sage of the sub races. Calvin Gongwer, who turns 74 on Sunday, is the oldest participant in the International Submarine Races being held this weekend off Singer Island. But this California guru of hydrodynamics research and engineering doesn`t confine himself to the ivory towers of academia. ``He`s so respected in the field, but he`s not a muckety-muck. He likes a good vodka gimlet,`` said Tony Carone, 42, the brawn behind Gongwer`s arm- powered entry in the local race. This weekend, Gongwer is getting his feet wet piloting his unique spherical entry in the race. He calls the clear acrylic orb the Knuckleball. Unlike the unpredictable pitches of baseball greats Phil Niekro and Hoyt Wilhelm, Gongwer`s Knuckleball travels in a straight line. This unique concept has three patents and ``kind of sinister`` potential for use on torpedoes, Gongwer said. Behind Gongwer`s tanned face -- reminiscent of an American Jacques Cousteau -- the wheels of invention are turning. Gongwer holds a degree in mechanical engineering from Columbia University, a master`s degree in aeronautical engineering from Cal Tech and about 80 patents, mainly for underwater devices. He has his own marine engineering company called Innerspace Corp. Working in his California garage in the 1950s, Gongwer developed 15 submarines similar to the vessels assembled this weekend -- sleek, cigar- shaped tubes with funny fins and innovative propellers. Several of the concepts were patented and snapped up by the defense industry. One of the subs even ended up slipping behind the Iron Curtain on a spy mission, Gongwer said. He also invented the Aqueon swimming aid. ``Swim with no more effort than walking -- at speeds never before possible. Inspired by the efficient swim thrust of the porpoise using only leg power,`` the brochure boasts. For the past eight years, Gongwer has been concentrating on building a massive tri-hulled, diesel-powered steel ship. The vessel can carry 135 people and weighs 400,000 pounds fully loaded. It can travel from Los Angeles to Sydney, Australia and back to Honolulu before refueling. ``I want to build one three times as big,`` Gongwer said. ``It would be ideal for a cruise ship. ``But that`s dreaming.``"
of folks who used his device. He was a prolific inventor and will be remembered fondly for his many accomplishments, rest in peace Cal. I have read of some disappointment about Phelps not actually squaring off against a Great White in a fin race "Mono e Carcharodon." Ignoring practical issues with gaining the shark's full cooperation with shooting ques, instructions, makeup, etc., there may have been a larger lurking problem, potentially bad for insurance premiums if not ratings? The Lunocet fins Phelps was using rely upon a pair undulating foils for propulsion. Undulating foils can be an efficient means of propulsion for divers but works even better for fish. Here's the rub, I have used a undulating foil propulsion system for a few decades, the Aqueon. It is a neat way to rip through the water at speed. The thing is, it can send some marine predators into hysterics. I have had barracuda whipping all around me gnashing teeth, shaking heads in attack mode when I have been going full speed on one of these. They looked really excited, wanting to bite something but I stopped before they came in for a taste. I had been doing a fast inverted dolphin kick for some minutes gaining the second reef off Ft. Lauderdale from the beach in no time when this happened. I have even had dozing nurse sharks wake up and take interest which can take a lot of motivation at times absent a prod. I didn't have any free swimming sharks conveniently at hand when I've been swimming hard much less a Great White but I wonder what sort of interest the undulating foil might prompt in one of these big boys? I have assumed for all these years that the undulating foils crank out some distinctive sound underwater, perhaps like a wounded thrashing fish, aka dinner bell. It makes sense after all and whatever the cause, a distinctly negative outcome might occur if you crank at full bore with the foils. So, in hindsight, it might be better than Michael and the Great White were joined on a computer somewhere as opposed to together in the water. ps - I have still failed to watch any produced content from Shark Week start to finish except from odd snatches online, like this. Perhaps the reruns, in a few more years? Some people just don't know what they are missing I guess.